There have been multiple reports of social media ‘restrictions’ being enforced upon volunteers for London’s 2012 Olympic. The 70,000 volunteers – called Game Makers – have been prevented from posting behind-the-scenes updates and photos to Twitter, Facebook and other social networks. The Game Makers will not be able to make their roles, locations, or details about the athletes and other VIPs public, nor discuss them online. The organising committee is getting some stick for this online, and told Reuters that it understood that many of the Games Makers would probably want to use social media to share the experience of the event with friends and family. The thing is, this is actually perfectly reasonable. Details about locations could cause security problems, and being snapped while you’re training is the last thing an athlete needs. It’s totally fair to implement social media guidelines, and since nobody’s actually seen the specifics, it’s easy to make this seem much more than it probably is. The exact wording seems to cover a restriction of: “revealing location, post backstage photos or give any information about the whereabouts of VIPs” – which again sounds fair. Where this becomes a little grey is the apparent rulings around making public statements relating to the London games, without prior permission from Olympics spokespeople, or speaking to schools about the events. Does this mean press? Is this a restriction of being seen as an ‘official spokesperson’? That’s fair enough, but it seems that Game Makers have also been told not to engage in conversations online about the events when in fact, they could probably provide some really engaging content about what goes on backstage. Of course, the organisers know that they’re dealing with a huge group of people. It’s risky to allow free access to how things are run, in case any problems are revealed. A rather frightened PR team is probably quivering at the very though. But really, these ‘rules’ are probably quite fair. When you’re supposed to be doing a job, even if you have volunteered, you really shouldn’t have your phone out. For many people, they’ll ignore this anyway. Some might get pulled up for it, but the majority will tow the line. This is a classic example of people getting hot under the collar about ‘rules’ that could be perceived as restrictive. Yes, it’s a shame that the organisers don’t have more confidence in their ability to run a tight ship, but a huge clamp down on freedom of speech this certainly is not. 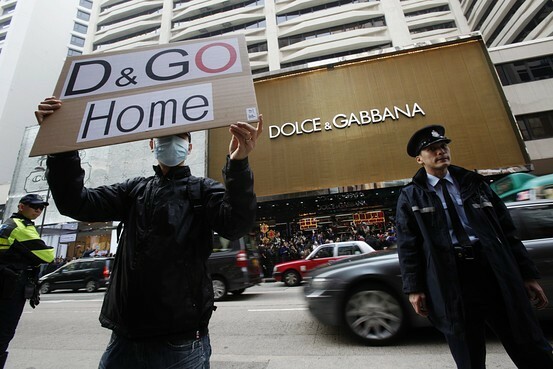 Now, Dolce & Gabbana banning locals from shooting photos outside its flagship store in the city’s Tsim Sha Tsu neighborhood, yet allowing tourists to take photos. That’s a real shocker.